40mm 18K white gold case, sapphire crystal back, screw-down crown, slate grey dial with gold applied hour markers with luminescent coating, self-winding caliber 240 PS IRM C LU movement with power reserve, date by hand, moon phases, seconds subdial, approximately 48 hour of power reserve, leather strap with fold-over buckle. Water resistant to 120 meters. 40 mm 18K white gold case set with 100 diamonds (~0.69 ct) and 32 baguette diamonds (~5.51 ct), 8.7 mm thick, white gold dial fully set with 255 diamonds (~1.36 ct) and 3 baguette diamond hour markers (~0.01 ct), caliber 324 S C self-winding movement with date and center sweep second hand, approximately 35-45 hours of power reserve, bracelet set with 150 baguette diamonds and paved with 803 diamonds, Nautilus fold-over buckle. Water resistant to 120 m.
40mm 18K white gold case set with approximately 1808 diamonds (~8.82 carats), sapphire crystal back, screw-down crown, diamond paved dial, self-winding caliber 324 S C movement with date and sweep second hand, approximately 45 hour of power reserve, 18K white gold diamond bracelet. Water resistant to 120 meters. 40 mm 18K white gold case, 8.42 mm thick, blue sunburst dial with gold applied luminescent hour markers, caliber 240 Q self-winding movement with perpetual calendar, moon phases, day, date, month, leap year and 24-hour indication by hands, approximately 38-48 hours of power reserve, 18K white gold bracelet, fold-over buckle. 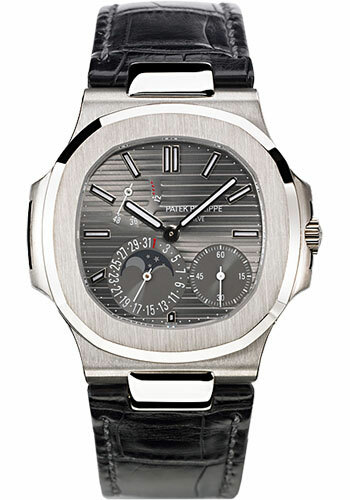 Water resistant to 60 m. Patek Philippe’s thinnest perpetual calendar.